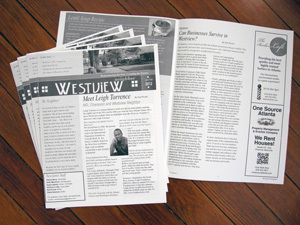 The “Westview Neighbor” newsletter launched in 2012. Various neighbors contribute stories, edit the newsletter, take photos, and hand deliver the newsletter to 1,100 Westview residences. If you are interested in placing an ad in the “Westview Neighbor” newsletter please email us at info@westviewatlanta.com. Download our sample ad size document (68KB PDF). Please supply ads in vector PDF/EPS file format. If this is not an option please provide high resolution (i.e. 300dpi) PNG/JPG/etc. files. Please do not provide low resolution or scanned documents. Parts of the “Westview Neighbor” is graciously funded by the Westview Community Organization, but we need additional sponsors and donors to continue to make it happen. Please consider donating a few dollars to ensure this treasure continues to circulate!